We are in the throes of a cultural opera set on 53rd st. 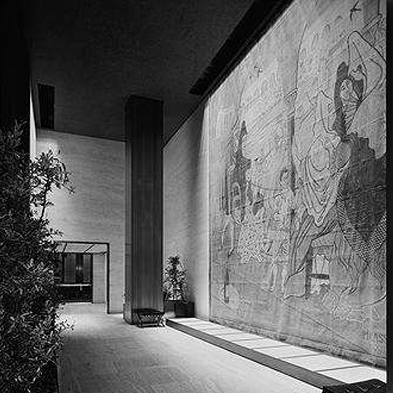 The damsel in distress is the Folk Art Museum, the much lauded early work by Tod Williams and Billie Tsien that is about to be demolished. The villian is The Museum of Modern Art whose voracious appetite for real estate is rapidly gobbling up everything in its relentless march westward. Cast as the heros are Liz Diller, Ric Scofidio and Charles Renfro who are supposed to come up with a brilliant concept that would appease their client while cleverly integrating the little building into the reconfigured museum so that MoMA will step up to the plate and do the right thing. As architects, we know that the higher the project profile, the more people second guess design decisions. So, concerned citizens have formed committees, editorials have been written and symposia have been held. Since this is our architectural family, and we admire, respect, and support everyone involved, it is difficult to sit patiently on the sidelines while the drama unfolds. We confess that when we are given unsolicited advice on matters of self improvement, we take direction poorly. Our typical response is to listen intently, thank everyone profusely for all their good ideas, assure them we'll look into it and get back to them, and then proceed to do exactly what we were planning anyway. We suspect that MoMA may not be very different. 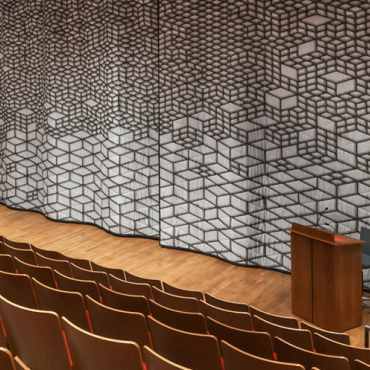 And, that it is likely that in the not too distant future the Folk Art Museum's celebrated facade panels will be packed up and shipped off to a warehouse in a distant borough awaiting a future installation in an appropriate setting. And the architects will hopefully eventually repair their personal relationships. Cities grow and change. Buildings once emblematic of their age pass out of fashion. Many of the people who participated in shaping the urban environment are no longer with us. Sometimes all we are left with are the images, evocative of what the buildings they represent meant in the cityscape of their time. We thought it might be helpful turn to photography. Ezra Stoller took the iconic pictures that defined New York in the era of Mad Men. 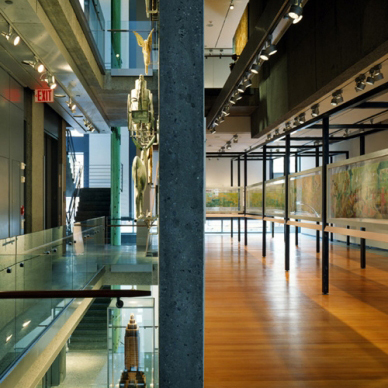 It is an extraordinary archive; it became the basis for our J-term project with our three Harvard Graduate School of Design externs at the BSA Space. Good architectural photography is a collaboration between the architect and the photographer because the images tell the story about the building to a much wider audience than will ever visit the building. 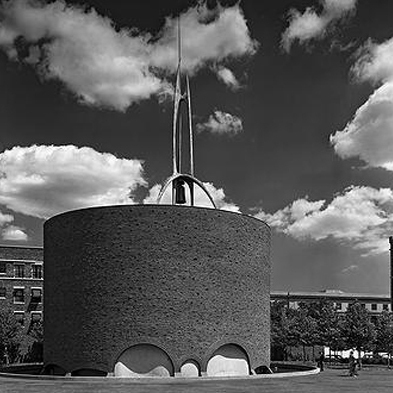 Anton Grassl joined us and took us on a photographic exploration of one of the iconic buildings of that era, Saarinen's Chapel at MIT. Anton frequently collaborates with Machado and Silvetti who have dealt with issues of historical preservation in their work. We are highlighting both his work and theirs this month. It goes without saying that another way of marking time is through art. 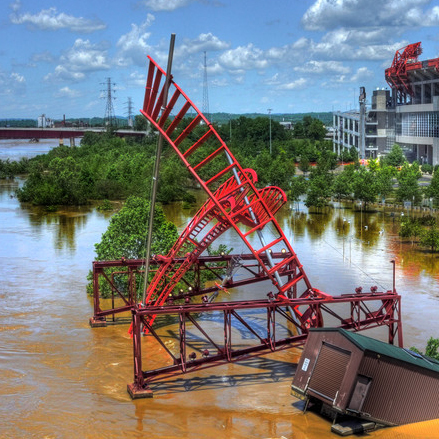 In 2010, for instance, the Cumberland River flooded Nashville. The Metro Nashville Arts Commission began its Watermark series, commissioning artworks for the neighborhoods that flooded. 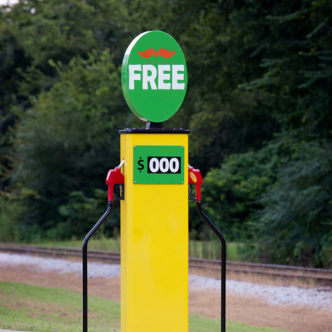 And finally, Lawrence Argent is our featured artist; some of his works, such as the Ghost Trolley pays homage to the formerly vibrant streetcar system. It is difficult to know what will resonate with a future generation. The best we can do is mark time: record oral histories, construct memorials, and archive the pictures. 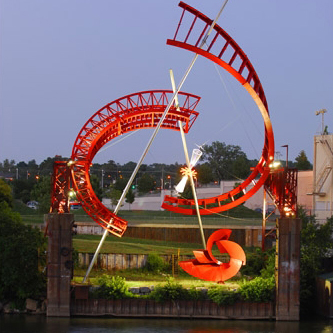 Nashville passed its public art ordinance in 2000. 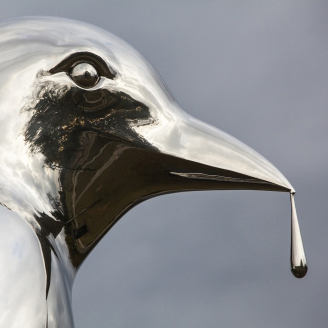 They have been grappling with the issues every city faces when they are developing a public art collection, namely commissioning art that is both relevant and engages the public. As cities become more bike friendly, bike parking racks become civic furniture design problems. 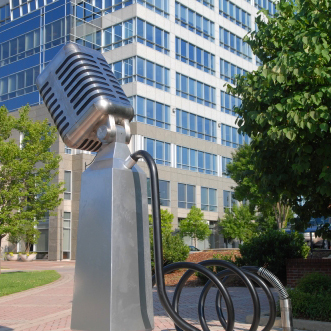 Nashville has commissioned a series of bike racks that commemorate different aspects of the city's culture drawing inspiration from the music scene as Microphone, by Keith Harmon, Mac Hill and Franne Lee does or the challenge of security like Matt Young's Emerge. 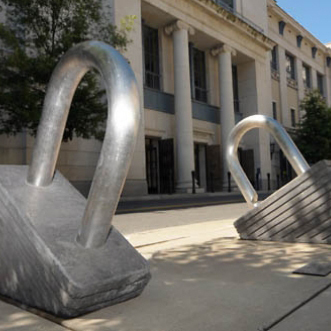 Sculptures like Citizen Thomas H. Sayre's piece in Public Square, allow its audience to interact with it by letting them crank the arms towards points of interest downtown. Another program, the Watermark Series, commemorates the 2010 flooding of the Cumberland River. Works have been created that are situated in the affected neighborhoods. 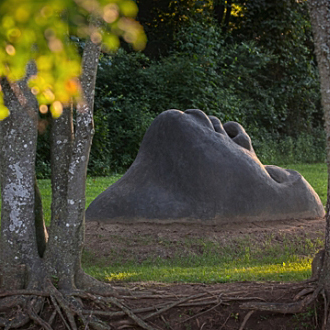 Buddy Jackson's Watermark: Emergence, is a sculpture of an African-American woman's face emerging from the ground symbolizing the resiliency of the Bordeaux community. 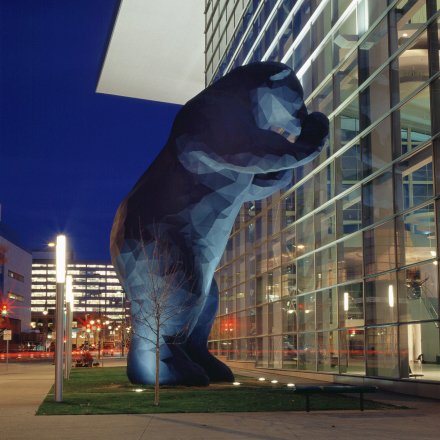 Denver Artist Lawrence Argent is probably best known for his big blue bear I See What You Mean peering into the Colorado Convention Center. Like all convention centers, the building consists of a very large black box of exhibit space and a series of expandable meeting rooms, surrounded by a vast corridor which is glazed in what seems to be an endless facade. Bears are native to the Rocky Mountains. They are also curious. Hence, the solution of having an oversized 40' tall bear standing in front of the equally oversized building ties everything together. Humorous, engaging, it has become iconic of Denver. Leap at the Sacramento Airport is metaphorically about flight and what flying means. 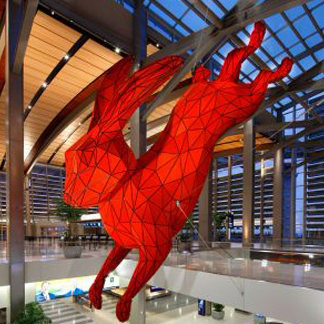 A giant rabbit (native to the area) jumps into a suitcase several stories down in the atrium. Most airports are really long corridors stringing the gates together. There is a cacaphony of signage to entice travellers who have little time to all the stores. Art placed in these settings is frequently the loser. Leap by virtue of its scale, color and exuberance holds its own. 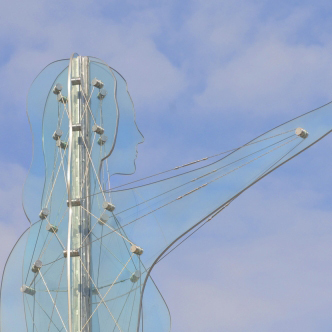 A third sculpture in this series was installed last month in downtown Chendu, China. 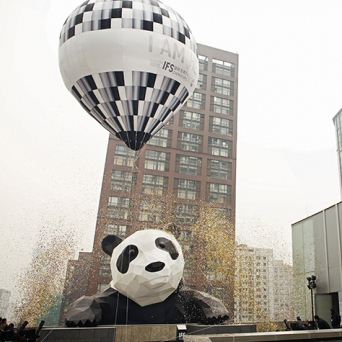 I am Here is a giant panda climbing up the side of a building on one of the main shopping streets in a gesture that calls attention to the plight of that species; it is reputed to be the largest panda sculpture in China. 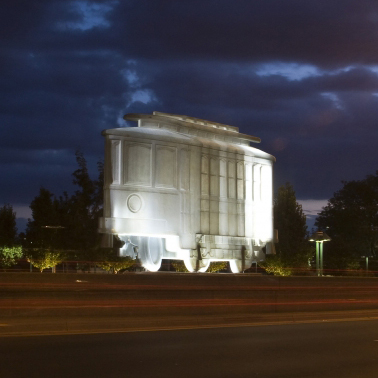 Ghost Trolley in a median strip in Aurora is a different kind of memorial. Many American cities developed along their streetcar routes. A major urban railroad system was begun in the 1870's in Denver. It lasted until after the second world war when the rail system gave way to the automobile. The Colfax corridor was the primary route that extended the city westwards to the mountains, the artwork commemorates the terminus of that line. The fabric painting will be removed on February 8th to allow for repairs to the stone wall behind. It is very delicate and may not be able to be reinstalled. To celebrate the inaugural Boston Design Week, cultureNOW has partnered with the BSA’s Architectural Photography Network to explore the impact of photography in shaping our perception of the cityscape of Boston. The program includes presentations by some of Boston’s foremost architectural photographers followed by a spirited panel discussion. James Kaplan, longtime member of the McManus Democratic Association, leads our annual walking tour of New York City's storied Hell's Kitchen neighborhood. 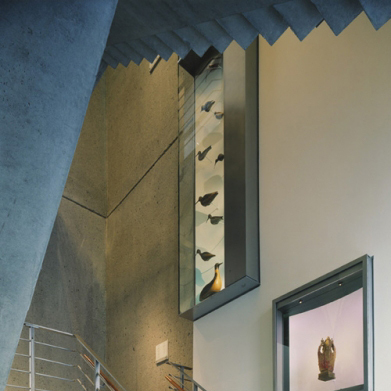 When architects get commissioned to add to historic buildings, they often come up with design solutions consisting of new modern structures joined to the original building by glass 'spacers'. There is some validity to this approach because it allows the architect freedom from the physical constraints of earlier buildings constructed to different programs, with different materials and different technology. These schemes are rationalized by being (at least conceptually) cheaper, easier to construct, and less invasive. It is somewhat more challenging to give a building a 'facelift' while updating it and 'bulking it up'. Rodolfo Machado and Jorge Silvetti are noted for mastering this approach. They often use the historical fabric as the genesis of their designs. 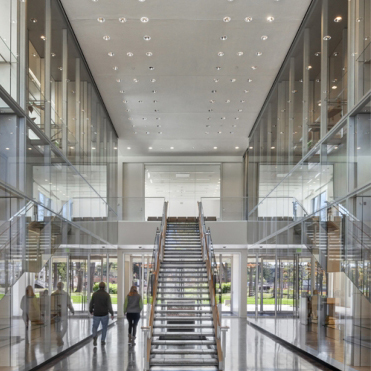 Major buildings include the classically inspired renovations to the Getty Pavilion and McKim Mead & White's Bowdoin College Museum of Art. But they shouldn't be pigeonholed. 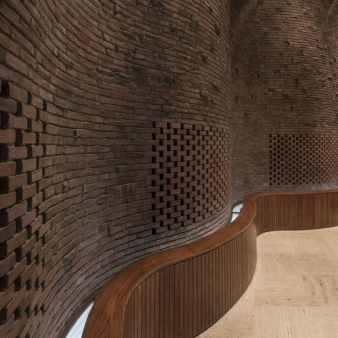 We thought that it might be more interestng to highlight several recently completed museums that are not traditional for them in order to illustrate some of the many routes possible when respectfully adding to an existing building or space. 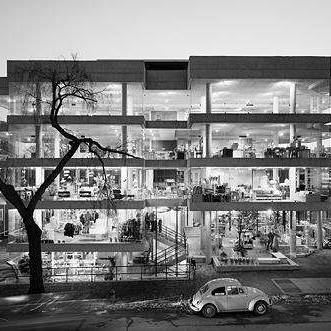 The Chazen Museum of Art for instance, doubled the size of the existing 1970 Harry Weese designed building at the University of Wisconsin in Madison. 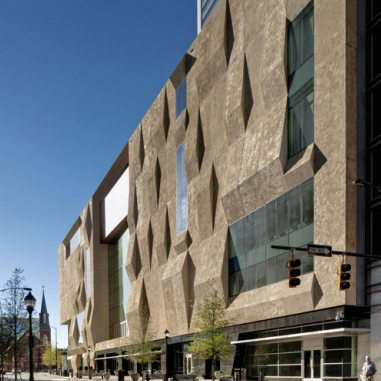 Charlotte's Mint Museum combines two facilties to create a cultural campus as part of an urban development. And, the Ruth and Elmer Wellin Museum of Art at Hamilton College created new facilities to attract more and better students. The MBTA Head Housesat South station are the subway entrances at the Red Line on the Greenway. Here the challenge was to create a readily recognizable sculptural form to signify the entry point. Travel was not as ubiquitous in the 50's and 60's as it is today. Ezra Stoller took the crisp black and white large format photographs of many of the major works of architecture that came to represent the buildings themselves for most people. We thought it would be informative to look what happened to some of those buildings. 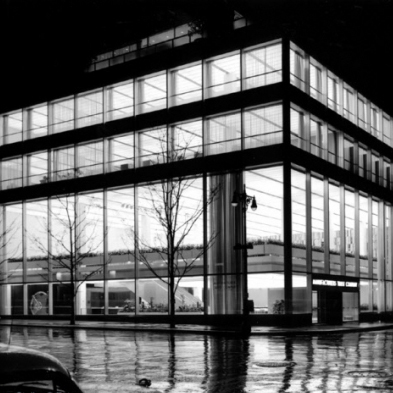 Skidmore Owings and Merrill's Manufacturer's Hanover Building on 5th Avenue, was the first glass bank. At the time a proper bank was a traditional stone edifice that looked solid. So, Henry Dreyfuss was commissioned to design a street level vault that would be secure. And, because it was a tenet of modernism that art should be incorporated into architecture, Harry Bertoia created a mobile that hung over the escalator and a screen that was a backdrop to the banking floor. Something like 30,000 people lined up to see it when it opened. 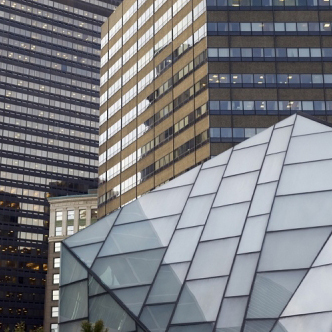 The building was landmarked, but last year a new generation of architects at Skidmore Owings and Merrill was commissioned to renovate their own building. 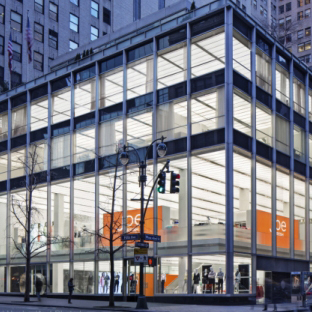 Rechristened 510 Fifth Avenue it is now a clothing store. The door is all that remains of the vault and the Bertoia sculptures are in storage. 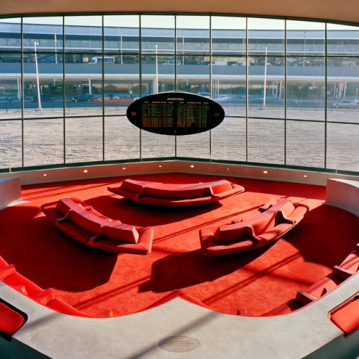 Eero Saarinen's TWA Terminal at JFK Airport hails from the early jet age. It has met a different fate. It too is landmarked. The Port Authority of NY and NJ painstakingly restored the building and brought it back to its original condition (minus one jetway) in 2011 without having a plan for what to do with it. It looks like a boutique hotel will open there next year. The neighboring terminals fared less well. IM Pei's 1969 National Airline Sundrome (Terminal 6) which was noted for the roof truss that allowed for the pioneering all glass enclosure was demolished several years ago. 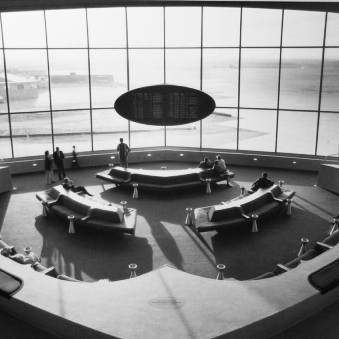 Sadly, the Pan Am Worldport symbolic of the 60's is in the process of being demolished by Delta. We teamed up with Boston Photographer Anton Grassl whose career has followed a typical trajectory. After art school he began taking photographs to make ends meet. He enjoyed it and proved to be good at it and eventually it became his day job. Photography has changed since he began. Darkrooms are no longer needed. And everyone has a digital camera on one end of their smartphone and fancies themself an expert. Photo shoots which used to be laborious projects involving endless jelling of light fixtures and waiting for the season to improve has become in this day of photoshop something adjustable on a computer screen. What sets a good photographer apart is an eye for composition and the care taken in crafting the images so that there is more to work with. 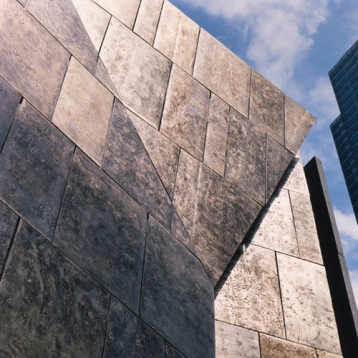 We asked ourselves whether the photographer's perspective of a building defined what it is. Could we revisit an icon of modern architecture 60 years later; would we look at it in the same way? 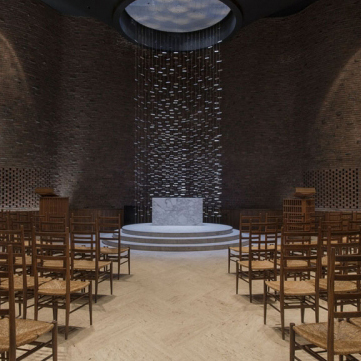 Anton took us on a shoot to Eero Saarinen's Chapel at MIT, a building which is still used as a chapel. It sits on a prominent site across from the student union. And, in fact, did not look dated to us at all. The Harry Bertoia suspended metal screen at the Alter looks as lovely now as it did in the earlier black and white photos. People were coming in to pray as we took photos. 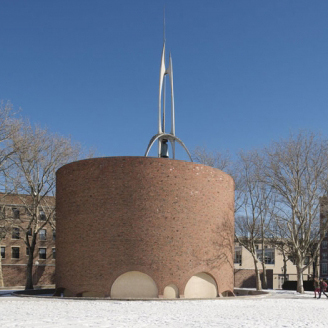 Theodore Roszak's bell tower is in perfect shape. Even the chairs haven't changed. When we went back to compare our images with the original Stoller shots, we found that we had selected many of the same views. We plan to continue the discussion in March at the BSA Space.